This is what I have done. 2 events back to back within a day. In fact less than half a day. The first event was the White Cane Run 10km. I’ve registered for this event in early January where it was supposed to be held on the 2nd February 2014 but it was postponed to 9th March 2014. MTSSR Triathlon event date was announced before the White Cane Run was postponed. So I registered for the triathlon since it has been a while since I did a triathlon. A few days before the events, I took the race pack for the White Cane Run and offered my bib number to a few of my friends since I will only be doing the MTSSR Triathlon. Since there was nobody really interested in my bib number and looking at the finisher medal, I was thinking if I can do both events. Looking at the start time and the event venue which was at the same area, I think I can do it. The White Cane Run flag off time was scheduled at 6:30am and the MTSSR Triathlon scheduled at 8:30am. 10km I can easily do under 1 hour and I would have around 1 hour rest time. I wasn’t planning to win the triathlon and difficult to win with all the ‘PROs’ joining. 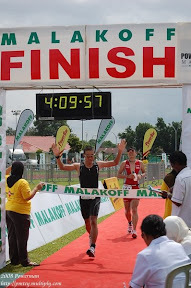 Managed to ‘poisoned’ Ahmad Fathi in doing the White Cane Run and Triathlon with me. Manage to control my pace for a 55mins run. The 10km route was a very fast route. No MOF hills this time, only MIPR hills. Just nice. Ahmad Fathi managed to do it in 47mins. Walk back from the Finish Line to my car which was parked at Belapan Stadium. Change clothes, change bib number, fixed the bike number and went to the bike rack which was at the swimming pool car park. I’ve manage to take my race number and do the body marking before the White Cane Run but didn’t rack my bike because the bike rack was not ready yet. The swim start around 8:30am as schedule and I was in the 2nd wave which was around 8:45am. My time of 13:27 minutes for a 500m was too slow for me. I was aiming for 11 minutes. Had a cramped at my midfoot as I started my swim. No time to stop, just keep on swimming and not to put to much pressure on my cramped foot. Survived the swim. 3 laps of 7.4km and the route was a bit of a challenge. MOF Hill, U-turn, Round about, headwind, crosswind and cars everywhere. My bike time was 44:47mins. It was a reasonable time but I could have done it better. Anakpanyu Cycling Team except for Reza Faizal participated in the event. The 5km run. I was targeting to do under 30mins which I managed to do it. I started my run around 9:47am and it wasn’t really hot at that time. Had a good sprint finished which I lost to this guy but overall time I was still faster. Weird. My 2 medals in 1 day. Team Anakpanyu won 1st in the Mixed Team Category. Overall it was a good event – The MTSSR Triathlon. It was a copy paste event of Panaga Triathlon. Hopefully next year they can do it event better.